As the mother of FIVE, (Yes, I know what causes them. That’s why we have so many.) I am constantly on a mission. My purpose in life is to raise responsible and socially conscious children. After all, the children of today are the future of this place we call home. I might have five children, but we have only ONE Earth. As such, it is vitally important with each passing day that we learn how to best care for and nurture our planet. Every family has different methods for motivating their children. Our kids all know the why and how of what we do and I have discovered this to be vital in their training. I also strive to make things fun. For without fun, what holds the child’s interest? 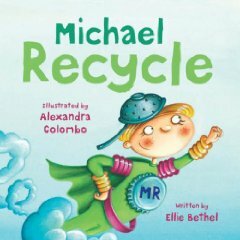 Our most recent find is, Michael Recycle by Ellie Bethel. Kids love Super Heroes and often want to be one. Why not encourage your child to be a Green Super Hero? After reading about recycling, tie on your Super Hero capes and go on a field trip. This is the perfect opportunity to visit a landfill and a recycling center. Even if you normally participate in curbside recycling, have the kids help sort and head for the drop off center. Bring your lesson back home. Set up your household recycling center then visit Earth 911 together to learn how to recycle items not picked up by your curbside program. Go on a walk through your neighborhood and pick up garbage. Talk about our planet and why its important to treat it kindly, do this often! Ask your children to brainstorm ways to be more Eco-Friendly at home. We do this at the dinner table, it’s a great way to keep nonsense chatter at bay and get their minds working! Once you have tackled the three R’s (Reuse, Reduce, Recycle), check out Planet Earth Eats Well by Madeline Kaplan and Eco-Friendly Families by Helen Coronato. Remember that every thing counts, no matter how small. It is likely that you will end up as I have, with the kids reminding me to recycle, bring my shopping totes and turn the lights out! If we as parents don’t take the time to teach our kids about respecting the Earth, who will? You are doing a wonderful job teaching your children about the environment, and using a superhero to make it more interesting is a great idea. I’ll have to find that book for my kids. I think my youngest would love it. Can you email any more info you have on your books- I would love to talk about them on my radio show. It is called the Green House Hour and is on 1593am. It is a live show from 2-3pm every Saturday.